I love cute smocked dresses. And “Australian Smocking and Embroidery” magazine is the place I go to get my fix. In my busy day I managed to get over to Simi Valley and get the last copy of the current issue. I am so glad I did. Not only was the drive beautiful since it snowed on the mountain tops last night, issue 85 is full of patterns and I want to make each one. Here are my two favorites. 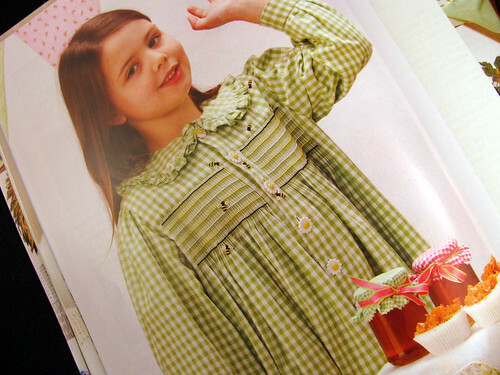 I love the ruffly collar and bees embroidered on the front of this smock. Smocking gingham is a joy because lining up the smocking stitches based on the checks is so easy. The yoke shape and piping make this dress special. It is so sweet the way the smocking pattern forms the floral waistband. 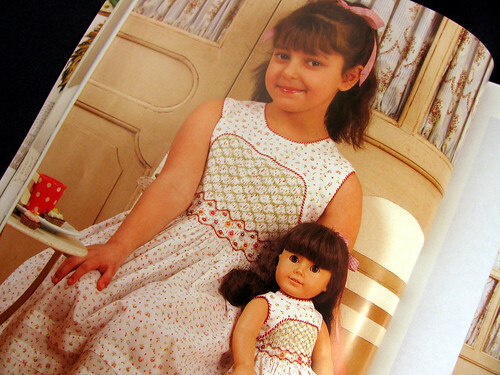 The matching dress for an 18″ doll doubles the cuteness. It will be a long while, at least a decade, before there is even the possibility of any little girls in our family. So in the meantime I will enjoy dreaming as I page through this gorgeous magazine. This entry was posted on Tuesday, February 10th, 2009 at 3:00 am and is filed under Sewing. Tagged: Book, Clothing, Sewing, Smocking. You can feed this entry. You can leave a response, or trackback from your own site.